Many years ago, I was a precocious (read, incredibly nerdy) high school student in a World Literature class. We began reading Crime and Punishment one morning in the fall and then kept... on... reading. We read that one novel for about four months. It was the neverending story, but with a decided lack of luck dragons. It was my first exposure to Russian literature and I was aghast at how little I enjoyed its bleak story. I kept hoping that my first impression wasn't indicative of the entire canon- I read and saw a number of Chekhov's plays and even took an entire history class in college about the Russian Revolution, where I read Pushkin, Chekhov, Turgenyev, Tolstoy, and more. I eventually decided we were never meant to get along and stopped trying so hard. I'd go see the plays, but the prose and I were finished. For years, my stubbornly closeminded impression of the greats of Russian literature was of being cold (I do hate the cold), of longing to go to Moscow, and resigning oneself instead of a life of hard work. 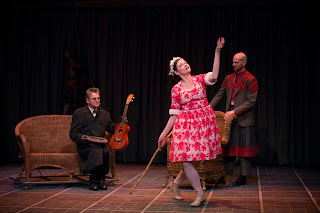 That being said, when I heard that the Shakespeare Theatre Company was bringing Big Dance Theatre's adaptation of two Chekhov stories, Man in a Case, to Washington, I went in with a good will. There wasn't any cold on that stage. Flannel, yes. Hats. Fuzzy hoods. Characters occasionally snuggling in for warmth. But that bone-deep cold, the lethargy- all those negative sensory images that I'd always associated with Chekhov's stories and plays- that was missing. There was no chill. Photo of Mikhail Baryshnikov, Tymberly Canale and Aaron Mattocks in by T. Charles Erickson. Instead, there was a surprising amount of warmth. There was quiet, yes, but there was also music. There was an intense vulnerability, and an easiness with occasional opacity that seems quite appropriate. Man in a Case takes two tales ("Man in a Case" and "About Love," plucked from a trilogy of short stories from Chekhov) and presents them in its house style, brought for this occasion into the Lansburgh Theatre. 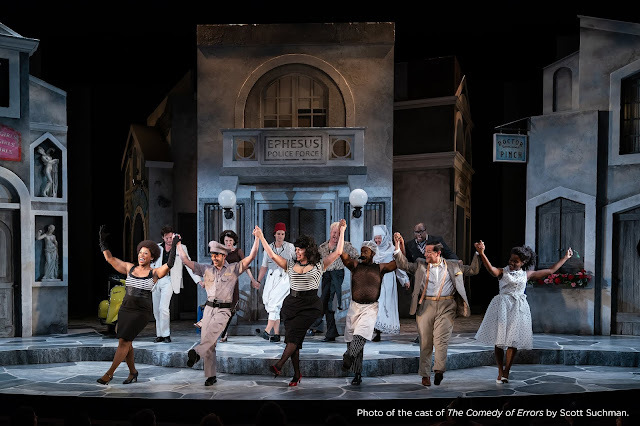 The lines between actors and characters are blurred before the house lights go down, and the minimal and abstracted set design by Peter Ksander gives the audience a further hint of what's to come. Clever projection work by Jeff Laron and fantastic sound design by Tei Blow fills in some of the blanks, but if you're looking for realism in this particular version of Chekhov, you'll be disappointed. In a way, there's something quite relaxing about theatre that isn't striving for realism. We can stop worrying about the tiny ways in which an aspect of a performance isn't quite "right", and take in the picture as a whole. When a story leaves behind language and begins a sequence told only through movement, we can let another part of our brain take over for a few minutes. Now, take that element of movement. As Belikov, Mikhail Baryshnikov is the titular character of the evening, wrapped tightly in a long winter coat, hiding in galoshes and spectacles, a hat and gloves. For every tightly wrapped layer he dons, and every schoolmasterly scowl, he manages to reveal to the audience a captivating undercurrent of fragility; he creates his case as protection from the world onstage and off (never removing his coat, even when only under the gaze of the audience). It's a wonderful performance, showcasing just how revealing restraint can be, and just how deftly it can function to build anticipation. 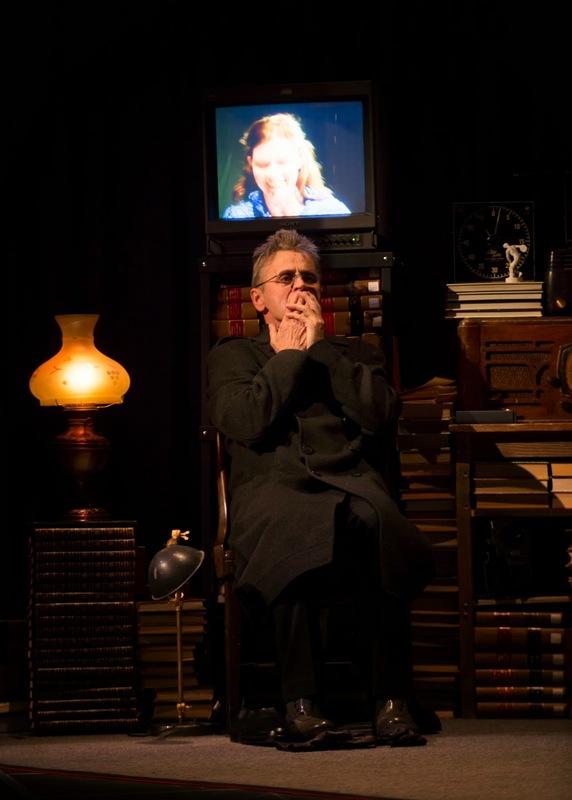 Photo of Mikhail Baryshnikov in Man in a Case by T. Charles Erickson. And if we can all take a moment to introduce ourselves to the elephant in the review, let's go on up to Baryshnikov hisownself. The more stiffly Belikov holds himself, the more the audience becomes desperate to see him move. When finally- finally- he does, I heard the tiniest, happiest exclamation of, "eeeeeeeee!!" from the woman seated behind me. It perfectly encapsulated what I felt as well, and I salute my unknown theatre-going comrade for giving voice to what we all wanted to say. The excitement of the audience over Baryshnikov's presence notwithstanding, the entire ensemble does excellent work here. There's always a distinct pleasure to be had from a company accustomed to working together in the same theatrical language (the only newcomer being Baryshnikov himself). Jess Barbagallo and Chris Giarmo serve as excellent guides through the world of the play, and Giarmo also provides wonderful musical support to the evening. Tymberly Canale's Anna has a wonderful pas de deux with Baryshnikov late in the evening that's truly lovely to behold. There's nothing breathtakingly new in Man in a Case, but there is certainly a happy satisfaction in seeing a tale well told. We've seen the tools that Big Dance Theatre likes to use before, but Annie-B Parson and Paul Lazar direct these actors and these tools of the theatre with great skill. As an adaptation of a prose narrative, I loved to see how light, sound, dance, narration, and dialogue all combined to transform a text for the theatre. Man in a Case is a treat, and I was happy to come out of the cold and into the warmth of Big Dance Theatre to experience it for myself.